AAI's very own Natasha Caldwell (AAI's Registrar and Red Rock Coordinator) and Kurt Hicks (AAI Guide) left this evening for a climbing road trip to Red Rock Canyon, just outside of Las Vegas, Nevada. They will be driving AAI's van down and dropping it off for the beginning of AAI's Red Rock climbing season, which started this month. Lucky them! Natasha and Shawn (another office employee) bid farewell. Natasha and Kurt look forward to warm desert climbing and to basking in Nevada's strong fall sun. They have done a lot of climbing over the years in the Sierra, Cascades, and in Squamish, BC, and they are excited to explore the vast sandstone cliffs of Red Rock Canyon. We'll get updates from Natasha and Kurt's trip over the next week, so stay tuned! Natasha loads up the AAI van Friday evening. Natasha will be gone until next Friday (Oct 5), so if you have a question about our Red Rock climbing program or want to sign up for a day or two of climbing, please contact Shawn Olson at shawn@aai.cc or 800-242-2249. Climbers, bike riders, and hikers all across the United States participated in a climbathon last weekend (Sept 22-23) to raise funds for children with aids. The climbathon, called Climb Up So Kids Can Grow Up, raised over $13,500 - enough for 38 children to have daily life-saving medicine for an entire year! Congratulations to the American Foundation for Children with AIDS (AFCA) for this success and to all the participants who contributed to this important event. -One man climbed 30 pitches in one day. -A team of bikers rode 114 miles (with over 7,500 feet of vertical gain) through the Cascade Mountains. -A 4-year old girl hiked in her neighborhood and managed to fundraise more than any other single individual. -With his baby on his back, one man hiked up a hill on a lazy Sunday afternoon. -A dedicated duo of students raised money by organizing their own mini-event at the University of Wisconsin Stevens Point. American Foundation for Children with AIDS (AFCA) is an independent international humanitarian aid organization established in 2004. AFCA is recognized as a 501(c)(3) not for profit organization incorporated in the state of Kansas, USA. The mission of AFCA is to improve the lives of children and youth struggling with the impact of the HIV/AIDS pandemic. We provide cost-effective relief, services, medical and social support, education and advocacy to help these individuals achieve their full life potential. Tom on Mt. Baker's summit. "I have been a Whatcom County resident for most of my life, and have looked at Mt. Baker and wondered what the view was like from up there. I have hiked and camped a lot, but have always considered mountain climbing a young person's sport, too expensive and dangerous for me." "One day, I saw the AAI brochure. The description and cost of your three-day Mt. Baker course convinced me that I should give it a try. I contacted two friends of many years, and we decided to climb the mountain." "On August 1, 2007, myself, my two friends, and my friend's 18-year-old son arrived at the Institute. There we met our guide, Kurt Hicks. We all hit it off immediately. After dumping a bunch of excess weight from our packs (thanks Kurt! ), we departed for the climb." 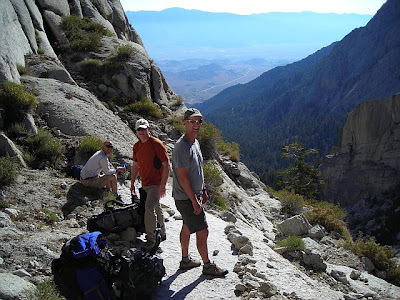 "The approach hike was pretty easy, but one of my friend's fear of heights issues made the Railroad Grade a challenge. Kurt was a kind and skilled counselor, and we made it to base camp without an incident. The course was fun and very informative. Kurt is a very patient and knowledgeable teacher. His positive manner and sense of humor were very reassuring to us novices." "On summit day, we arose from our warm sleeping bags at midnight and began the climb. Kurt's advice on clothing was spot on. He set a pace that was attainable by all, with well-timed rest breaks. After seven hours of crunching through the snow and ice, we arrived at the summit (with style). Now I know why people climb mountains. It was the experience of a lifetime." "I would like to thank Kurt for everything. Without the knowledge we gained on the course, I would have collapsed in a puddle of lactic acid far from my goal. The many different strides he taught me allowed my leg muscles to get me there. His humor and skill was much appreciated, and he made the hard work of mountain climbing a lot more fun." "Thanks for a great climb, and a spectacular view! I appreciate your Institute, and I plan to summit Baker with you again soon. Mt. Baker from the southwest, looking at the Easton and Demming Glaciers. 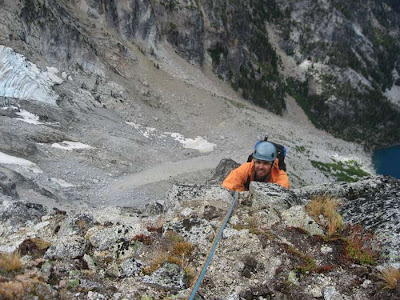 On September 2, AAI guide Danny Uhlmann and John Kear completed the third ascent of a new route on Mt. Shuksan in Washington's North Cascades. The route is called the Northwest Arayete - and yes, it is spelled that way. The route was first put up in August by Northwest climbers Darin and Matt (see their cascadeclimbers.com trip report - search by route: Northwest Arayete). Darin explains: "We called it the Northwest Arayete as a a play on words between arete and Araya, the name of my daughter." As Darin says in his report, there is already a Northwest Arete and a Northwest Rib, so those names were already taken. 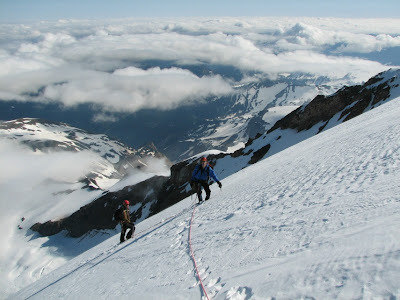 The Northwest Arayete, according to him, "follows the crest of a fine arete on good rock for nine pitches to the summit of a prominent horn above the White Salmon Glacier. Though dirty at times, the position is incredible, the rock is solid and every pitch is sustained for it's grade." John Kear and I awoke at 5:30am in our tent, just above the Fisher Chimneys on the White Salmon Glacier of Mt. Shuksan. 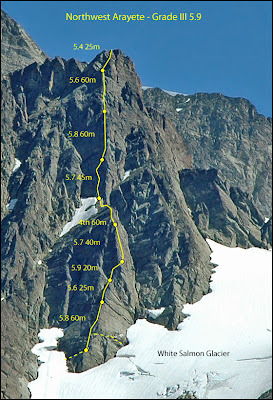 Our plan was to climb a new route, put up in early August, called the Northwest Arayete, which is a grade III 5.9, according to the first ascentionists. The weather had been quite unsettled yesterday, the day we climbed up the Chimneys, and we were unsure if rain was close on the horizon. Occasional high winds made the decision even more difficult. We originally planned to do the new route, which ends on the upper White Salmon Glacier, and then continue up the NE ridge of the summit pyramid. We left the tent, after a few rounds of lemon and Earl Gray tea, at 6:15am, and did the quick jaunt across and down the White Salmon, to the base of the rock buttress. The first ascent team and the second ascent team accessed the route from the bottom of the buttress by rappelling off of snow bollard. We noticed a much easier way to access the buttress a little higher and climber's right, which allowed us to easily walk directly on to the rock via a snow ramp in the glacier. This led to a stance beneath a 100-foot-long traverse pitch, which intersected the original first pitch about halfway up. The next pitch was supposed to be 5.8 and runout. I found two or three pieces of protection on the whole thing, and one of those wouldn't have done much to hold a long fall. 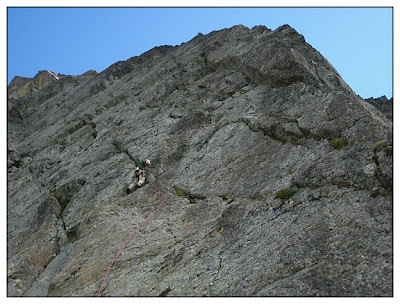 I reached the belay, relieved to have the "uncertain" slab climbing behind me, and belayed John up on an anchor I built. Matt Alford pulling around onto a beautiful orange wall. The sky was still gray; dark clouds to the west and flat light. After another short pitch we were at the base of what the route description considered the crux, a 5.9 traverse that possibly needed some thin pitons for protection. With this in mind I headed up the pitch with a hammer on my side and a few bugaboo pins, just in case. Fortunately the previous party left a key pin at the crux, which I used. It traversed sharply up and right, the crux short and positive, and around a corner to an exposed hanging belay. This was followed by a long 5.7 face pitch on quite loose rock. I haven't had to climb this slowly in a long time, but leading on loose rock demands care. John seconded this pitch a was pulling off as much of the loose rock as he could, which was a lot. It is always quite a sight watching rocks fall hundreds of feet. Matt Alford starts up the steep upper wall. 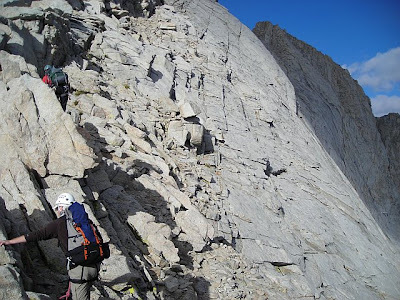 Soon we were at the upper buttress, which is home to the final three or so pitches of the route. Again, fairly loose and difficult to protect climbing followed. I led about fifty meters out, taking a new line through a roof because it had protection, maybe 5.9++ or 5.10a, instead of following the route description. I ended the pitch by slinging a large, detached pillar for a belay. Following this we climbed two more varied crack, moss, and slab pitches to the summit of the buttress, had a quick snack and changed into boots, and made the quick descent to the glacier beneath. This, the southeast side of the buttress, was receiving wind and occasional rain - plus, it was noon, and we wanted to be leaving our camp by 1:30pm to accomodate our ever-important social schedule. We decided to forgo the summit - both of us had been there before - and we headed down to camp, packed up, and were at the truck by 5pm. Stellar climbing on the crest of the Arete. Overall, this was an interesting route, though not recommended for the average 5.9 climber. It features lots of runout in certain places, difficult protection, and moderate route finding. The green schist that composes this buttress is not the most solid on Shuksan, but it will get better with repeated ascents. Who knows, maybe it'll be a classic in ten years. It was a good adventure and worth it, as all new routes are. AAI's September 2007 E-Newsletter was just published, so if you aren't on our email list and want to check it out, you can view it at www.aai.cc/enewsletters/enewsletter-sept07.asp. -A feature article about Jim and Jessica Easter, a father and daughter climbing pair who started out when seven-year-old Jessica came home one day from school and announced to her dad that she "wanted to be a mountain climber." 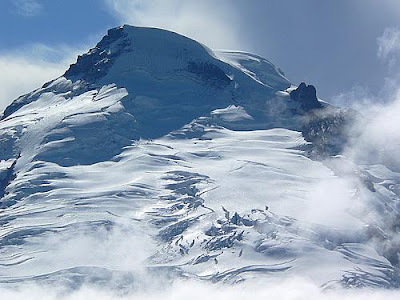 -An Expert Tips article by AAI guide Alasdair Turner called "Mountain Weather - When to go for the summit" that is full of great tips for building your judgment and knowledge of weather patterns and how they might affect your climbing trips. 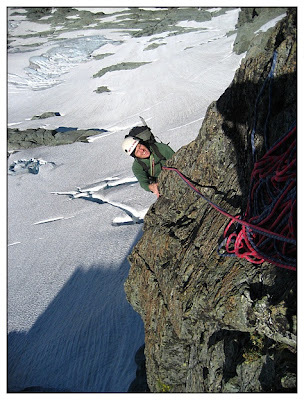 -A review of our 2007 Guides Choice Equipment Award Winners! -A chance to enter your mountain photos in our November Photo Contest and win up to $200! Kaj's group on the East Arête. Our adventure to climb the East Arête of Mt. Russell was close to not actually coming together, since we had left the arrangements a little late with respect to engaging a guiding service. The usual pressures of work, and its attendant distractions, resulted in our small team of climbers forgetting about the timing of the weekend and the demand for guides - this was after all the Labor Day weekend! However, after some quick calls American Alpine Institute came through for us, and they even had the wilderness pass waiting and ready to go. Our trip to Mt. Russell was secured. 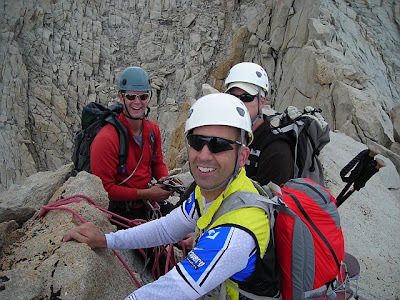 Our small team was made up of three climbers, excluding our guide Jason Martin. We were coming in from different locations. Nick Fohl and Steve Talmage were coming in from San Francisco, while I was coming in from Seattle. The plan was to fly into Burbank Airport and depart for Lone Pine Ranger station, where we were to meet our guide, Jason (who had his own journey to make from Las Vegas). There were a lot of moving parts at the start of the trip, which fortunately all worked out, so that we were able to meet at Lone Pine just before 2pm. After the quick introductions, we set off for the Mt. Whitney Portal trailhead to undergo the equipment checks and then start the hike to Upper Boy Scout Lake, where we were to camp for the next two nights. On the approach above the Ebersbacher Ledges. We set off at about 3pm and headed up the Whitney Portal trail before turning off and taking the trail toward Lower and Upper Boy Scout Lakes. The weather was a little overcast, which made for a cooler hike in, although we were rightly concerned about the possibility of lightning. Again, the good lady of fortune was looking out for us, and our concern for lightning never came to pass. After a fairly strenuous hike into the camp with our 45- to 50-pound packs we were able to get our tents up and settled into a camp routine and dinner before the light totally faded away on us. Then it was early to bed as Jason wanted us to get started on the route by 4:30am the next morning. Putting harnesses on for the ascent! The next morning started with the alarm blaring at 3:30am. The team quickly sorted itself out over their ablutions and breakfast, during which we were entertained to a series of shooting stars, and then we hit the start of our climb at 4:40am. Our route took us across Clyde Meadow, where we then hiked up a talus field to reach the saddle between Mt. Russell and Mt. Carillon. This was a classic talus hike in that each two steps you took you felt like you gave up one step. However, we did make good time to reach the East Arête on Mt. Russell. We took a short break and put on our harnesses in preparation to rope up for this class 3 route. It was not long after we started that Jason decided to get us roped up for the ridge, and under his guidance and leadership, we were able to thoroughly enjoy the adventure of climbing the East Arête. The weather was also favorable, and it allowed us to take in some very dramatic scenery and exposures along the course of the climb. We summited at around 11am, and we took the opportunity to enjoy the views and eat some lunch. Our descent took us to between the east and west summits of Mt. Russell, where we descended about two hundred feet to get to a trail that would take us down the southern face of Mt. Russell. I was lucky enough to be given the opportunity to lead the team down, while Jason belayed us from the top. We came through this descent relatively quickly and then faced the inenvitable prospect of moving through the talus and bolder field, which was a little more slow-going for the team. This took us to the pass just above Iceberg Lake (near the Mountaineers Route on Mt. Whitney), which we scrambled down, and then we got back onto the trail back to Upper Boy Scout Lake. Although this sounds like it was a relatively straightforward route - and in many regards it probably is - this should not discount from the fact that it was still hard work to make our way down through the loose talus and boulder fields along the way! We arrived at camp around 3:30pm and felt the effects of our long day in the mountains almost immediately. Steve and I collapsed for a long nap, while Nick and Jason took it easy and enjoyed the views. By the time everyone was rested, we were ready for dinner to replenish the used up calories and afterwards settled in for the last night in our tent. In the morning, we rose at a respectable time of 6am - positive luxury in alpine climbing! 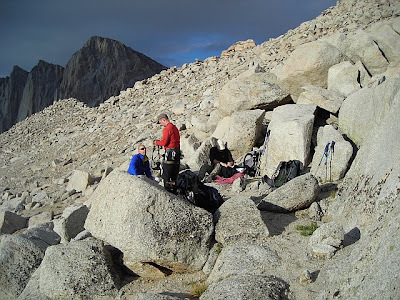 We took care of breakfast and packing up camp, so that we were back on the trail by 7:30am. We were back at the the Whitney Portal trailhead around 10am, where we shed our packs and said our goodbyes to Jason. His guiding capabilities and easy manner made this a great trip for our team. 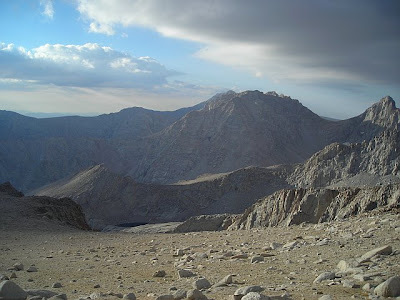 Fortunately, we were able to shower at the Whitney Portal as well, thus saving a large number of airline customers from the misfortune of dealing with our three-days of trail filth. All in all not a bad trip, when considering it nearly did not come off. For information on our Guided Ascents in the Eastern Sierra, please contact AAI Program Coordinator Coley Gentzel at cgentzel@aai.cc or by calling 800-424-2249. It seems as soon as September 1st rolled around, a whole lot of people started thinking more in terms of fall and winter and began signing up for our Avalanche Level 1 course. Luckily, we are offering many dates this winter (11 to be exact), starting in December and ending in March. 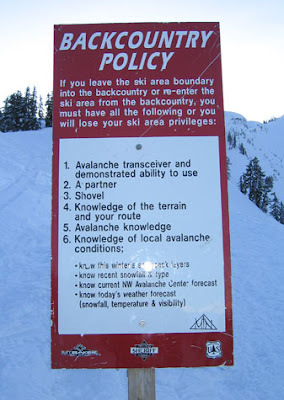 The 3-day Avalanche Level 1 uses AIARE curriculum (the American Institute for Avalanche Research and Education) and you receive a certification of completion at the end. The course is for skiers, snowboarders, and snowshoers who are ready to step out of bounds and into the backcountry. 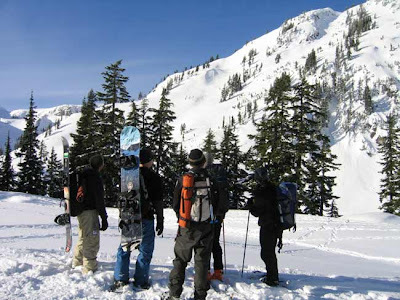 It will equip you with the knowledge and decision-making skills needed for safe backcountry travel, including sound avalanche hazard assessment and solid rescue technique. Call or write Shawn Olson with questions: shawn@aai.cc or 800-424-2249. Stay safe in the backcountry! Well, that was it for my Alps season. My last guided trip went very well, and I'll be heading home to the States on September 24. Tim halfway up the Frendo. Start of the snow and ice arete and face. If you are interested in a late season Alps climb, or if you want to talk to someone about booking in the Alps for next year, please write Andy Bourne at abourne@aai.cc or give him a call at 800-424-2249. 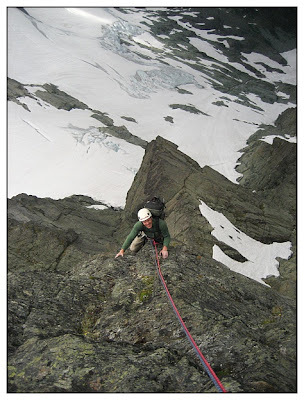 If you haven't already, check out our Expert Tips page for great, informative articles on the various facets of alpine climbing and general backcountry living. 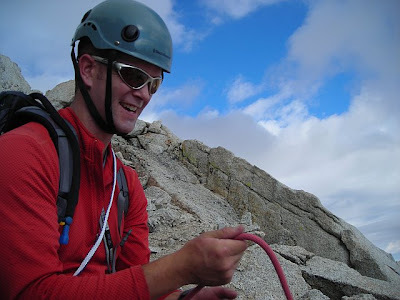 Check out the latest article from AAI guide Erik Johnson, "How to Build an Alpine Rack." Also, keep your eyes peeled for the newest edition to our Expert Tips page, an article by AAI guide and Cascades local Alasdair Turner: "Mountain Weather: When to go for the summit," which will appear in a couple days. As always, send us an email or give us a call at 800-424-2249 with questions or comments! 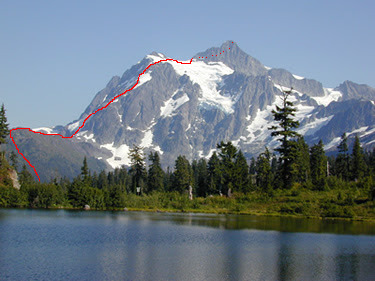 For many Northwest climbers, Mount Shuksan is the quintessential Cascade Peak. With dramatic hanging glaciers, elegant ridges, and mandatory glacier travel and rock scrambling, a climb of Shuksan is a very complete undertaking for any mountaineer. Of its dozen or so routes, nearly all of them can be considered classics, and the mountain has a route for every ability level. AAI staff members Danny Uhlmann and Mitchell Harter climbed the North Face route over the August 22-23 weekend and found near perfect weather and conditions. I have admired beautiful Mt. Shuksan since I moved to Washington almost two years ago. A couple weeks ago I decided I would get an up-close look at the mountain by climbing one of its classic routes, the North Face. I climbed with AAI guide Danny Uhlmann and we decided we would descend the beautiful Fisher Chimneys route. Read the rest of Mitchell's trip report here.